The common etiology of Activity Intolerance is related to generalized weakness and debilitation from acute or chronic illnesses. This is mostly observed in older patients with a history of orthopedic, cardiopulmonary or diabetic problems. It also results from obesity, malnourishment, anemia, and side effect medications. Activity Intolerance is different from Fatigue. Fatigue is an extensive and subjective draining feeling not treated by rest but can also cause tiredness. Further, the goal in Activity Intolerance is to increase tolerance for and endurance of activity. In Fatigue, however, the goal is to assist the patient to adapt to fatigue, and not to increase endurance. The nursing goals are to reduce the effects of inactivity, promote optimal physical activity, and assist the patient with maintaining a satisfactory quality of life. The following are the common goals and expected outcomes for Activity Intolerance. Patient will exhibit tolerance during physical activity as evidenced by a normal fluctuation of vital signs during physical activity. Patient will identify factors that aggravate activity intolerance. Patient will report the ability to perform required activities of daily living. Patient will verbalize and use energy-conservation techniques. Patient will identify methods to reduce activity intolerance. Patient will maintain blood pressure within normal limits 3 minutes after activity. Assess the physical activity level and mobility of the patient. Take the resting pulse, blood pressure, and respirations. Consider the rate, rhythm, and quality of the pulse. If the signs are normal, have the patient perform the activity. Have the patient rest for 3 minutes and then take the vital signs again. Provides baseline information for formulating nursing goals during goal setting. Pulse takes longer than 3 to 4 minutes to return to within 6-7 beats of the resting pulse. RR increase is excessive after the activity. 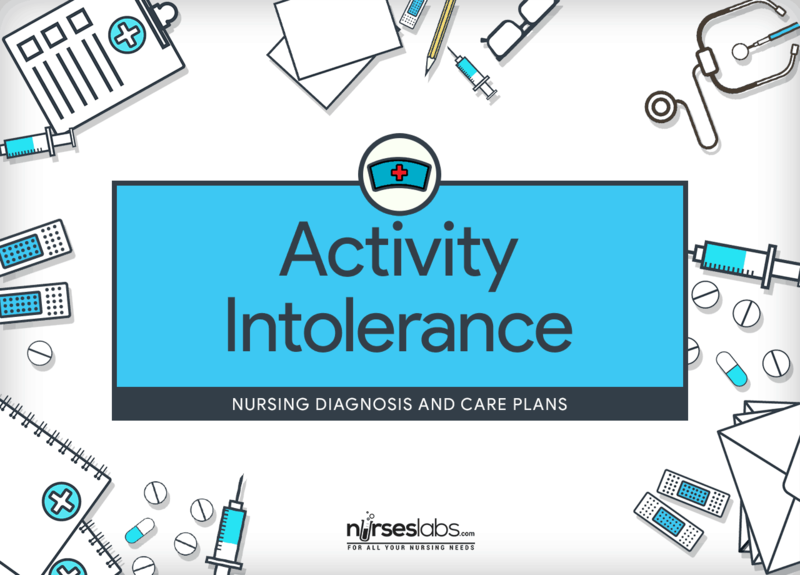 Investigate the patient’s perception of causes of activity intolerance. Causative factors may be temporary or permanent as well as physical or psychological. Determining the cause can help guide the nurse during the nursing intervention. Assess the patient’s nutritional status. Adequate energy reserves are needed during activity. Observe and monitor the patient’s sleep pattern and the amount of sleep achieved over the past few days. Sleep deprivation and difficulties during sleep can affect the activity level of the patient – these needs to be addressed before successful activity progression can be achieved. Determine the patient’s daily routine and over-the-counter medication. Fatigue can limit the patient’s ability to perform needed activity. It can also be a medication side effect. Pay attention to the patient’s use of beta-blockers, calcium channel blockers, tranquilizers, antihistamines, relaxants, alcohol, and sedatives. Assess the need for ambulation aids (e.g., cane, walker) for ADLs. Assistive devices enhance the mobility of the patient by helping him overcome limitations. Use portable pulse oximetry to assess for oxygen desaturation during activity. May determine the use of supplemental oxygen to help compensate for the increased oxygen demands during physical activity. Assess the patient’s baseline cardiopulmonary status (e.g., heart rate, orthostatic BP) before initiating activity. In normal adults, HR should not increase more than 20 to 30 beats/min above resting with routine activities. Older patients are more susceptible to orthostatic drops in BP with position changes. Observe and document response to activity. Close monitoring will serve as a guide for optimal progression of activity. Assess emotional response to limitations in physical activity. Depression over the inability to perform activities can be a source of stress and frustration. Establish guidelines and goals of activity with the patient and/or SO. Motivation and cooperation are enhanced if the patient participates in goal setting. Evaluate the need for additional help at home. Coordinated efforts are more meaningful and effective in assisting the patient in conserving energy. Have the patient perform the activity more slowly, in a longer time with more rest or pauses, or with assistance if necessary. Helps in increasing the tolerance for the activity. Gradually increase activity with active range-of-motion exercises in bed, increasing to sitting and then standing. Gradual progression of the activity prevents overexertion. Dangle the legs from the bed side for 10 to 15 minutes. Prevents orthostatic hypotension. Refrain from performing nonessential activities or procedures. Patient with limited activity tolerance need to prioritize important taks first. Assist with ADLs while avoiding patient dependency. Assisting the patient with ADLs allows conservation of energy. Carefully balance provision of assistance; facilitating progressive endurance will ultimately enhance the patient’s activity tolerance and self-esteem. Provide bedside commode as indicated. Use of commode requires less energy expenditure than using a bedpan or ambulating to the bathroom. Encourage physical activity consistent with the patient’s energy levels. Helps promote a sense of autonomy while being realistic about capabilities. Instruct patient to plan activities for times when they have the most energy. Activities should be planned ahead to coincide with the patient’s peak energy level. If the goal is too low, negotiate. Encourage verbalization of feelings regarding limitations. This helps the patient to cope. Acknowledgment that living with activity intolerance is both physically and emotionally difficult. Range-of-motion (ROM) exercises in bed, gradually increasing duration and frequency (then intensity) to sitting and then standing. Deep-breathing exercises three or more times daily. Sitting up in a chair 30 minutes three times daily. Walking in room 1 to 2 minutes TID. Walking down the hall 20 feet or walking through the house, then slowly progressing walking outside the house, saving energy for the return trip. Duration and frequency should be increased before intensity. Encourage active ROM exercises. Encourage the patient to participate in planning activities that gradually build endurance. Exercise maintains muscle strength, joint ROM, and exercise tolerance. Physical inactive patients need to improve functional capacity through repetitive exercises over a long period of time. Strength training is valuable in enhancing endurance of many ADLs. Provide emotional support and positive attitude regarding abilities. Patient may be fearful of overexertion and potential damage to the heart. Appropriate supervision during early efforts can enhance confidence. Provide the patient with the adaptive equipment needed for completing ADLs. Appropriate aids will enable the patient to achieve optimal independence for self-care and reduce energy consumption during activity. Teach the patient and/or SO to recognize signs of physical overactivity or overexertion. Knowledge promotes awareness to prevent the complication of overexertion. These techniques reduce oxygen consumption, allowing a more prolonged activity. Encourage conscious-controlled breathing techniques (e.g., pursed-lip breathing and diaphragmatic breathing) during increased activity and times of emotional or physical stress. Have the client breathe in through the nose, then breathe slowly out through partially closed lips while counting to seven and making a “puuu” sound. Have the patient sit comfortably with knees bent and shoulders, head, neck relaxed. Breath in slowly through the nose so that the stomach moves out against your hand. The hand on the chest should remain as still as possible. Place one hand in the upper chest and the other just below the rib cage to allow the palpation of the movement of the diaphragm during breathing. Tighten the stomach muscles, letting them fall inward during exhalation through pursed-lip. Helps in performing efficient breathing by maximizing the expansion of the lungs.